Hi! I'm CuteBurger!I have just joined Scratch in August 2015, and I got to know about Scratch by watching some videos on YouTube. I have been programming with an app on the Ipad. I love to code too! I really don't know... Anything that pops up in my dream? 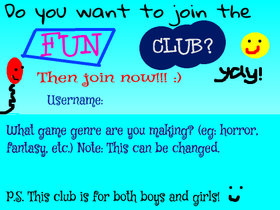 The Fun Club sign up sheet!